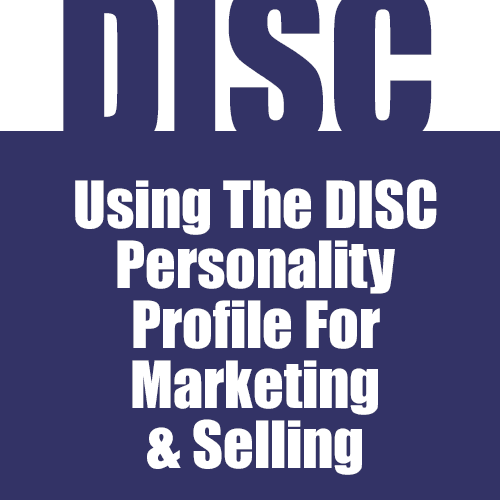 Using the DISC Personality Profile for marketing and selling is one of the strongest tools in my toolbox. Knowing my personality type and that of my customers assures that I will be working with people who I will enjoy! So what is the DISC Personality Test? Inducement – These are the fun people who like to be around other people. Submission – These are the nice people who nurture and support. Compliance – Like CPAs and Accountants, these guys need lots of details to be able to function. They like order and structure. Great, so what does that mean for our marketing and selling? A LOT! The easiest example I can give is myself. I am a “D” so I like things fast, fast selling cycles, fast implementations without a lot of hand holding, few questions and let’s get ‘er done! When I see a marketing piece that tries to sell me using A LOT of words, I shut down and move on. If you send me an email longer than few sentences, I fritz out and “save for later” because it looks like a lot of effort. Now, if I was “C”, I would be horrified by a sales piece that is just a couple of lines. Where are the details so I can make a buying decision? So, now you have an overview, lets drill down into each of the DISC Personality types to see how to market to them and what selling tools you can use to close the sale! So if you are selling to a D, you better get to the point fast. Bullet points and headlines make content easier to read and digest. We like to control our consumption so you may be able to use the phone but don’t start with, “what are you doing or how is your day going”. Niceties are lost on D’s, we just want to get on the phone, find out what is needed or what you are selling and get off. If you are sending a marketing message out to D’s, use bold statements. My marketing to D’s includes, “not a sing kumbaya, hand holding coaching program, I assume you will do what you commit to without me having to check with you every day”. Now that sounds harsh if you are another personality type, but for a D (who I like to work with), it is so much better than some kind of boilerplate marketing drivel. Remember, fast and to the point. D’s make buying decisions fast. Rarely will we ponder for days, let alone weeks, on whether or not to buy something. We are jump right in and get started kinds of kids. That being said, don’t forget, we can dump you just as fast so you might want to spread your marketing around a bit! If you are selling to an I, you need to make is sound like you are in it together. I’s are much like D’s in not wanting to have too much to read and going into overload if you have a four page marketing proposal. They will not want to hurt your feelings and will promise to look at it, but will probably find someone else that makes working with them easier. You can ABSOLUTELY call an I and ask them about their day. They will love it and want to find out about yours too! If you are sending a marketing message to I’s, make sure there are a lot of people in there, and they better look like they are having fun! Talk about working together, being a team and you better have a bunch of contact points. I’s will not go off and work by themselves for days, they need to be with people and like to do things together. I’s make buying decisions based on the person they are working with. They will not be swayed by some slick talking D coming along behind you. If they like you they want to work with you, the end. Keep up that relationship with good communication and you will have them for life. I like steady instead of submissive. S’s are the people who everyone counts on to get things done. If you are selling to an S, you need to make it sound safe and secure with guarantees and lots of testimonials from happy customers. They will read your marketing message and will probably have questions about your products. When prospecting S’s, you can call them, making sure to ask how their day is going and about their business or family. When sending your marketing messages, make sure to have trust symbols like the Visa and Mastercard logos, the Better Business Bureau logo, license numbers (if applicable), etc. You want to talk about having been in business for X-number of years and about how you are going to be around for the long haul. S’s like to make sure everything will stay on an even keel. S’s make buying decisions slowly and will stay with you forever as long as you don’t rock the boat too much. You can make changes, just make sure to give them notice and time to assimilate them! Oh the C’s. I think of the C’s like CPA, details, details, details! They want to know every bit of your sales process, work flow and reporting deliverables. They will need A LOT of data to make a decision and will need a number of phone calls to close the sale. When sending your marketing message, no stone should be left unturned. They WILL read them all, highlighting points that they need to clarify before buying. C’s also like trust symbols and to know the background of any company they work with. Include degrees earned, certificates achieved, awards won, etc. C’s make slow buying decisions and need to nurtured into buying so make sure that you send them a series of direct mail pieces or emails. The first one could be an overview of your products or services and the subsequent ones could be more details about different aspects. There you have it, at least a start on how to market using the DISC Personality for marketing and selling! Previous Post: « What Is The ROI On Social Media Marketing – Probably Not What You Think!